P. Craig Russell has a wonderful drawing style, not just the techniques but also the designs. His panels flow effortlessly, the covers capture attention, and the environment designs are beautiful. This huge 256-page hardcover artbook is a splendid retrospective on the life and career of Russell. The write-up is first person and quite detailed, covering the early works, and titles including Dr Strange, Marvel Fanfare, Oscar Wilde, The Ring of the Nibelung, The Spectre, Elric, The Thief of Baghdad, short stories and other adaptations and also unfinished and abandoned projects. There are lots to see and read. There's even one chapter dedicated to storytelling with extensive commentary from P. Craig Russell. It's an impressive collection of amazing artworks. Another wonderful artist-focused artbook from published IDW. 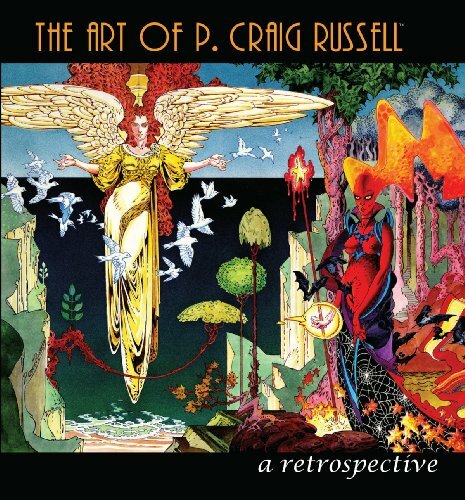 Highly recommended to fans of P. Craig Russell and comic art.